If you have multiple devices in your home – and we all probably do – then you definitely want an easy way to share photos from one device to another. Cloud Syncing, Cloud Sharing, and Cloud Storage services allow for your photo library to “live” online, so that you can access your photos from multiple devices, or easily share files with friends and family. For instance, you might want to store a photo in a place where everyone can access it, even if they switch devices. You might take photos on your phone, but want to edit them on your computer. You might be truing to gather a bunch of pictures together for a slideshow, or share photos from an even with many people. All of these situations call for some time of cloud syncing/sharing/storage service. Which one depends on what you want to do! What is Cloud Storage, Anyway? Storing files on “the cloud” is like an online version of a hard drive, but that drive isn’t on your computer. Your files are living on a virtual server that belongs to someone else. Companies are renting you space and convenience, since their server is accessible from anywhere you have internet access. So cloud storage has no actual “cloud” holding data, it’s just a term that helps people understand that you’re accessing files over the internet. I recommend cloud syncing/storage services for simple file sharing among family members and for ease of use between devices. However, remember that not every service that syncs or stores your files are actually backup solutions! Many services have backup functionality, but they are not foolproof systems. The safest way to protect your files is to also have something that performs automatic backups of files daily: see here for my top three picks for picks for cloud-based, automatic backup. 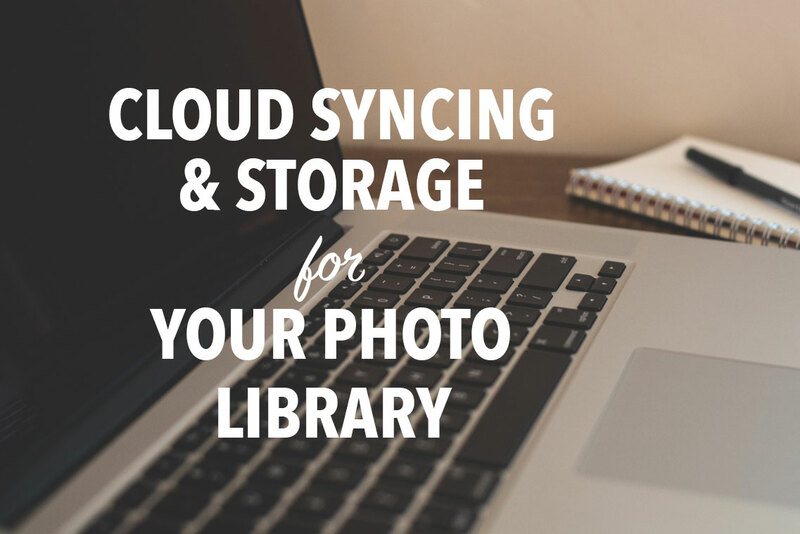 Cloud Syncing services sometimes act as temporary storage for pictures – just remember that they ought to be only one of at least three places you store/backup your photos. Read more about automatic Cloud Backup Services here. Dropbox is probably one of the most convenient, reliable, and well-known cloud syncing applications. It’s a simple solution for file storage for multiple devices, accessible from almost any device. PROS: Dropbox has a free plan that is super accessible for a lot of people; you can store up to to 2 GB. It’s also well known and well integrated for many other apps/brands, which means you can get the Dropbox app on every device you own. CONS: It’s relatively expensive to jump to the higher capacity plan (compared to other services), and there’s no “middle ground” plan cost or space-wise. There’s also not much you can do if someone accidentally deletes a shared file instead of just removing it from their dropbox. Just remember that you can’t consider Dropbox a true backup, although the camera upload feature comes close to a backup service for phone pics. $9.99/month 1 TB. This makes sense if you’re trying to store a lot of files for a longer term – maybe you’re using Dropbox to work with a team or extended family (for instance, we often share photos from family reunion through Dropbox, or use it to gather photos for a grand kid calendar). If you’re already an Amazon Prime Member, then you are in luck today! As part of your Prime membership, Amazon provides secure, unlimited space in the Amazon Drive for photos. Seriously! It’s called Prime Photos. PROS: It’s free! Well, it feels free because most people consider Prime a sunk cost for free shipping, and any other perks are just icing on the cake. Files that are .jpg, .tif, and raw files will not count towards your Amazon Drive capacity. It’s truly cross-platform: you can upload from any device with a desktop version, browser version, and app version of Amazon Cloud Drive. All versions have drag and drop functionality. CONS: It’s not technically free (since you have to be a Prime member to access it, so that’s $99-120/year) but if you’re like me, paying for Prime is about getting free shipping, and any other perks feel like icing on the cake. It only holds photos – any other files, including videos, apply to your storage limit for Amazon Drive. Sidecar files for raw files also count against that storage quota. The app is very basic – so some features you might expect might not be available yet. (For instance, creating a shareable link to a folder of images instead of just a single image). There is no automatic backup feature in Prime Photos. PRICING: Prime Photos itself is free if you have an Amazon Prime membership ($99/year). If you don’t, then Amazon Drive is 11.99/year for 100 GB, or 59.00/year for 1 TB. Try Amazon Prime 30-Day Free Trial to check out Prime Photos. If you are already a Prime member, then head here for more information about Prime Photos. Google Photos is Google’s answer to storing photos for access across devices. If you’re already comfortable in the Google sphere of apps, then you know that they are already rocking the file-sharing world with Google Drive. Google Photos is the picture-focused arm of the Google universe. You can actually store high resolution (not full size) versions of your files on their servers for FREE! PROS: It’s free for high-resolution versions of you photos, though not full-resolution. It integrates seamlessly with Android/Google phones, although it’s also available on iOS devices and Mac computers. You can set it to automatically backup from your computer. CONS: They don’t store full resolution for free. It’s not super easy to browse through your own photos, and there are only basic sharing functions. But Google Photos meant for storage, and it does that well. PRICING: Google Photos is free for files lower than 2048px (which is pretty high res for beginner cameras). You can pay for the ability to store high-res versions, and those would count against your Google Drive storage space. Up to 15 G of larger files stored for free (including everything in your Google Drive), before higher priced plans kick in. iCloud is an Apple-universe syncing service for your devices. The iCloud is meant for safekeeping (aka device backups) and easy sharing of those files between family members. Most apple device users already use the iCloud Photo Library to gather & backup pictures between their devices. You can also turn on the function to put the full quality pictures in the cloud and only store lower res pictures on your phone, which gives you space for more photos. PROS: iCloud is fantastic for backing up photos you take on your phone. 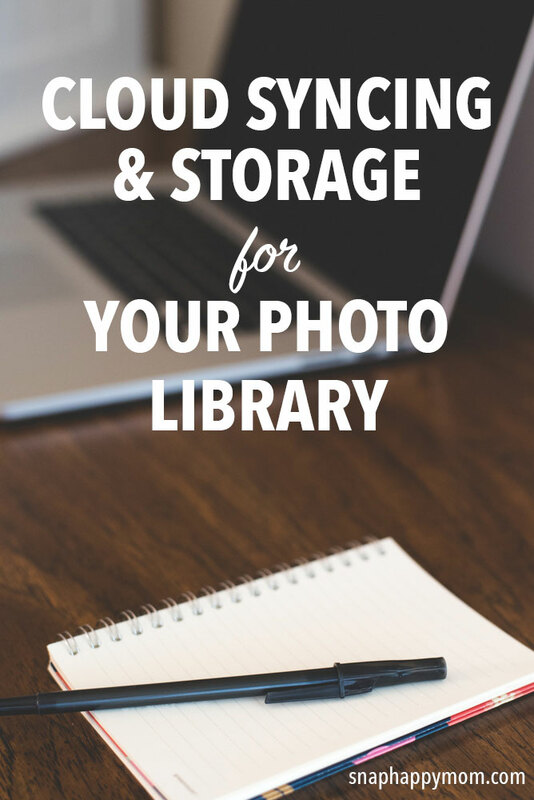 It automatically frees up space on your phone if you set it up to do so, and allows you easy access to photos on your home computer as well. The biggest capacity plans can be shared with up to 6 family members, which is super convenient for a shared family photo album. You can also easily backup your devices, including all your photos, to restore them if they are lost or damaged. CONS: iCloud can only be used on Apple devices, which might be limiting if you are a cross-platform family. Also, because iCloud is so ingrained in the functionality of Apple products, some people misunderstand how it works. (For instance, many people are confused about whether something lives in iCloud if they delete it from their phone. Most people don’t truly understand if iCloud is serving as a cloud storage or cloud backup). PRICING: 5 GB is free, 50 Gb plan is .99/month, 200 Gb is 2.99/month, 2TB is 9.99/month. The higher two tiers allow for family sharing. I was under the incorrect impression that OneDrive wasn’t an option for me because I use Apple/Mac 100%. It turns out your platform doesn’t matter at all, and Apple users can absolutely use OneDrive. Basically, Microsoft’s OneDrive System is an all-encompassing solution to file sharing, syncing, and backup, and collaborating. It’s a lot like Google Drive, except you can also set it to automatically backup your computer. You can access files on different devices, and edits and changes get synced automatically across all the devices. PROS: It’s available for both PC and Mac computers/devices, at a pretty inexpensive price. It’s already wrapped into Microsoft 365 if you’re using that for word processing applications, which means it’s an extra perk cost-wise. You can set it to auto-upload pictures as well. CONS: Since OneDrive stores so many other things, there’s not a lot of advanced photo features. PRICING: You pay for Microsoft OneDrive depending on the space and features you need. There’s a free version for up to 5 GB, and then a 50 GB plan for 1.99/month. The more cost-effective way to use One Drive is if you also need Microsoft Office 365 for word processing functions. Then you can pay $69.99/year for 1 TB, and still get the perks of Office 365. SugarSync is a bit different from other services because it is taking continuous backups of every any folder/file you put in your virtual drive from any computer/device you have. SugarSync is trying to bridge the gap between cloud backup, cloud storage, and cloud syncing. It stores all those files in a master system in the cloud and backs them up continually as you go. Once something is put in your drive, it will update itself whenever you resave that file. This is super useful to create an online “home-base” organizing system for all your stuff, accessible from any computer hooked into your SugarSync plan. PROS: Sugar Sync shines in the ability to access and sync files across multiple computers (and even operating systems). CONS: Sugar Sync is incredibly powerful, but at the cost of possibly overwhelming a regular user who might not need all those features. If you have lots of devices and you switch between them a lot, Sugar Sync might be a great solution for you. PRICING: Pricing for Sugar Sync has a couple of tiers. The cheapest is $7.49 a month for 100 GB. I suggest you us an external hard drive at home, a dedicated cloud-backup service, and then 1-2 of the above cloud storage or cloud syncing services for easy sharing/syncing from day to day. Overall, my advice is that you backup your photo library in several places and with different services. It’s hard to tell which services and brands will be supported years from now, so it’s always good to have multiple backup options. COMMENT: Which service are you using, and why?